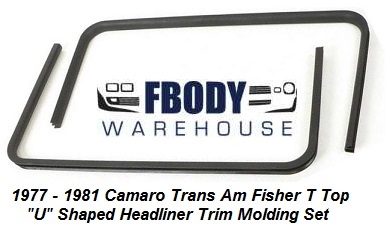 Fbodywarehouse carries all of the interior trim plastics needed for your 1979 1980 1981 Firebird and Trans Am. From rear armrest panels to headliner trim and pillar posts, we have the parts you need. We also offer reconditioned GM used items to supplement items which are not in reproduction at this time. This allows you to buy everything needed for your car’s interior at one place! 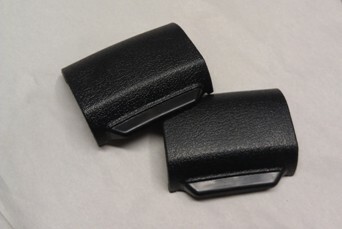 Replacement trim clips for the left and right plastic headliner trim for 1974 – 1981 Camaro and Trans Am / Firebird. These retain the trims above the windows. This is a set of new OER kick panels for 1970 - 1981 Camaro and Trans Am with or without air conditioning. Please specify when ordering by using the drop down scroll boxes below. ** As a Pair, or only the side you need. GM authorized for a true and correct fit. These panels usually deteriorate around the stem that wraps the door hull. Make your restoration complete with a set of new kick panels. This is a new standard package tray. Produced By REM, this is the tray that sits on the rear shelf above the back seat. These usually get dry rotted and dingy, so this is an inexpensive way to make your back seat area look like new again! These are the standard package trays and do not have the perforated speaker holes. you can trim out for use of factory speaker grills. Note does include correct Vinyl accent strip and foam strip. Be sure to use the drop down scroll box to pick your color needs. This is a set of new upper side headliner trim for 1974 - 1981 Camaro and Trans Am. These are sold as a pair left and right and replace worm,chalky or broken units. Inlcude new mounting clips and screws. This a new reproduction rear view mirror for a 1970 - 1981 Camaro and Trans-Am. Correct reproduction mirror can be used with standard or deluxe interiors. Mounting Kit also available for additional charge. NOTE: Rear side of the unit is a polished backer and is not the black rear face like GM issue. This a roll of NEW Deluxe Seat Back Chrome Accent Trim Piping for a 1970 - 1981 Trans Am. This material is the chrome plastic bead that runs up the sides and over the top of the front bucket seats. This roll includes enough to do both seats. This is a set of NEW sun visors for 1970-1981 Camaro or Trans Am. Available in standard vinyl or perforated vinyl. Produced to exact factory specifications including correct stitching, OEM factory color, and the original one pin or 2 pin design to maintain complete originality. US Shipping included in the price, Canadian and International orders, please selct the shipping surchage in the drop down box below. Trim service on your new panels. "out of the box onto the car." 1970 - 1981 Trans Am Lower AC Dash Vent "Lap Vent" See INSTALL VIDEO Also! This is a new lower lap vent for 1970 - 1981 Trans Amand Firebird models with factory air conditioning. 1 on the glove box door. *NIote - We also sell the retainer clips for these vents! This is a used GM carpet guard for 70-81 Camaro and Trans Am. This unit mounts on the toe board under the drivers side dashboard area and covers the mounting bolts for the steering column where it exits the cabin. This is a good used GM part and serves as a kick plate at the column base. Sold as a set , 1975 - 1981 Camaro Trans Am Sail Panels are now available and in stock! Come in black. New replacement seat trim covers for use on most 1975 - 1981 Camaro and Trans Am. This is a used GM 1974 - 1981 Trans Am Firebird Camaro factory red sail panel coat hook. NOTE reproductions are NOT true to GM and do not have same shape so original GM is best for a purist car or a correct restoration. This is a set of 2 new reproduction seat belt guides for 75-81 Camaro and Trans Am. These are the triangle style, and are most commonly found on 78-81 model cars, but will fit on earlier model cars that use the rectangular base. Comes in black only. This is a full interior clip and fastener kit for 70-81 Trans Am. Includes mounting hardware for interior panels, door panels, console, seats, and dash. This is a set of New Rear Armrest Panels for your 1970 - 1981 Camaro or Trans Am. This is a passenger side kick panel mounted vacuum pump for Air Conditioned equipped cars. Bladder has been tested and is strong ready to install includes connecting rod for the flapper. This is a set of seat belt buckle covers for 74-81 Camaro and Trans Am. This is a NEW set of under column cover plate screws for 1970 - 1981 Camaro Trans Am. These are the screws for the plastic cover plate that is below the steering column where it mounts to the firewall. Also known as the carpet guard. This is a set of two. For use on all 1970 - 1981 Camaro & Trans Am models. Injection molded reproduction of the carpet firewall guard used on 1970-81 model Camaros. Mounts to the firewall below the steering column. Replacement of this item is recommended whenever installing new carpet.